I’m definitely a little late to the game here, and I’m not sure how I didn’t find out about this sooner, but the Amgen Tour de California is being streamed live from their site – and in a very slick fashion to boot! Until now I had been catching up on the highlights through Versus (which is doing a great job as well – other than maybe Rasika Mathur ;-), but after my first trial of the “live” page I’m really impressed. Other than slight hiccups and delays it’s a stellar experience (if only it came in HD). 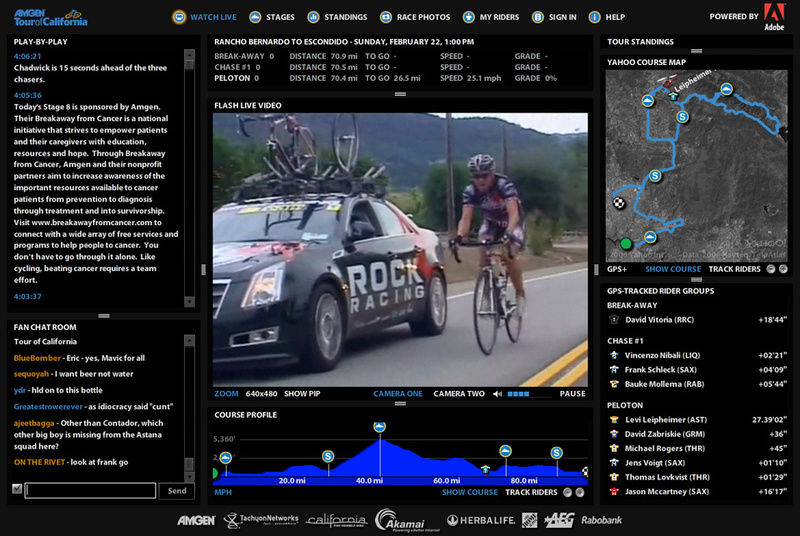 You get a large preview pane of the video coverage which you can interact with, change camera views on the fly, as well as track the riders progress through the course on a live-updated map. Also really fun, is to see the riders progress on the course elevation-profile, giving you a better understanding of the layout of the course. And of course you can check unofficial split and finish times. As if that weren’t enough, for the fans wanted to get their word in edgewise, there is a fan chat room as well at as play-by-play from the press. All in all it’s a really fun, immersive way to digest the tour (especially since there’s zero coverage of it in Canada – boooo). Perhaps we’re looking at the future of television – I wouldn’t be too disappointed. You can check things out here, but I’ve included a screen shot to whet your appetite. Sweet! Another thing to distract me from my work. Lance Armstrong – 7th in TOC. Should be interesting to see what happens this season. How much longer will he be riding as a domestique? Yeah, not sure – I think right now his fitness isn’t necessarily where it should be, but it’s still early in the season and he’s focussing on the TdeF from what I hear. It’s not quite as exciting (for me) when he’s not the leading man, but he still gets the crowd out (in North America, anyway) so I figure it’s good for the sport, and great for cancer too. I did a little bit more digging, and for the tech-nerds like me, there’s some coverage on Allan Padgett (the creator of Tour Tracker) on cyclingfans.com. Interestingly there’s also a great video tour of the application highlighting all the key features (some of which I didn’t even realize while I used it). Hopefully, as the article hints, we can look forward to seeing much more coverage of races in the near future.